FOOD AND FAITH IN LENT Throughout Lent there will be a weekly reflection on Food and Faith. It will include an excerpt from the World Council of Churches Ten Commandments of Food and a simple, meatless soup recipe for each week in Lent. We hope you try the recipe and that the reflections will be thought-provoking and promote mindful eating this Lent. I. Give thanks for what you eat. This may be something we do every day, but for many of us it can be a rote phrase, something we do but don’t put a lot of thought into. When we give thanks, to whom do we give thanks? For what are we giving thanks? Let us reflect on this the next time we “give thanks” before we partake in a meal. The Southcoast of Massachusetts is blessed with many local farmers who raise food for our consumption while caring for and nurturing the earth while they do it. Think about signing up for a CSA (Community Supported Agriculture) share this summer. Many farms have full, half, or quarter shares, taking into consideration the different needs different families may have. Or frequent the many Farmer’s Markets our communities have to offer. SEMAP and FarmFresh.org are great resources to find a farm close to you! Part of the intent of this Lenten activity is to help us be mindful of what we eat; that is, be thoughtful of what we eat as we prepare and eat it, and consider from whence it came and how it ended up on our tables. “Moderation” suggests not eating too much of one thing, and not consuming in excess. This leads us into the fifth commandment. The United State Department on Agriculture estimates that 40% of all food produced in the U.S. is wasted. Organizations like The Society of St. Andrew (http://endhunger.org/food-waste/) are working to reduce that through action and education. What can we do in our own homes to reduce waste? Buying only what we’ll consume, freezing leftovers, and maintaining a compost bin are just some of the ways we can reduce waste, and in the end save money as well. VI. Be grateful for those who grow and prepare food for your table. VII. Support fair wages for farmworkers, farmers, and food workers. These two commandments are related – because we are grateful for the work and the hands that make us possible for us to eat each night, we should therefore support fair wages for those who get it to us. We can do that by selecting when possible fair trade, organic, and/or local produce. When demand for those products increases, it demonstrates that it is important to us as consumers the well being of those who raise our food and get it to the places from which it is purchased. Remember that local farms employ local residents to work on the farms and generally treat their employees well. During this Lenten season, we ask you to consider sacrificial gifts to the restoration campaign, supporting our faithful stewardship of the building which houses our ministries, outreach, and community collaboration. 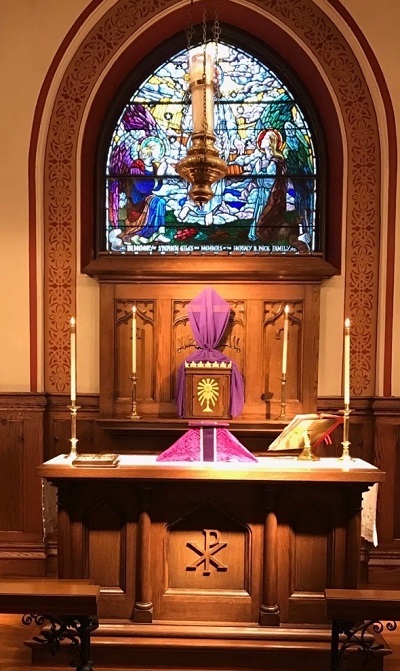 A box will be placed in the back of the church throughout Lent, beginning on March 1, to Easter, April 16, for your special offerings to Grace Church and to the community we serve. Immediately following the 10:00 am service on those same Wednesdays, we will offer recorded music, as was done in Advent. Save the Date – Lenten Soup Supper April 5 at 5:30 or when you can get there. Grace Church friends and activists! Come join us on Wednesdays for a Lenten brown-bag lunch conversation as we ask together “What is the role of the Christian Church in resisting evil?” Some of us want to learn about German Lutheran pastor and theologian Dietrich Bonhoeffer – author, anti-Nazi activist, and, ultimately, Christian martyr. What was his role in the creation of the ‘Confession Church’ movement within German Protestantism in Nazi Germany? We will use as a guide for our conversation selections from Dietrich Bonhoeffer’s writings, gathered thematically in God is on the Cross: Reflections on Lent and Easter. We will encounter themes of prayerful reflection, self-denial, temptation, suffering, and the meaning of Christ’s cross Passages from Dietrich Bonhoeffer’s letters and sermons provide special encouragement as we prepare ourselves spiritually for Holy Week and Easter Sunday. This volume also offers an introduction to Bonhoeffer’s life and a Scripture passage for each day of the season. Some of us will also be reading biographies of Bonhoeffer, sharing our learnings with each other. Please let Rev. Andrea know if you would like a paperback copy of the book. We will gather on Wednesdays from March 8 to April 5 at Noon. We will meet informally, sharing conversation over lunch. Bring your own bag lunch! We will gather in the Youth Room on the lower level of the Church, near the offices. Please call Rev. Andrea at 508-259-7501 or email her at revandrea@gracechurchnb.org.